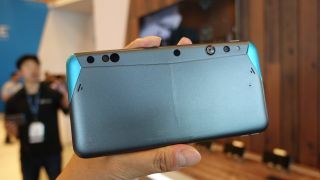 At IDF 2015, Intel CEO Brian Krzanich announced Tuesday that Intel is partnering with Google to bring Intel's RealSense 3D camera to Google's Project Tango smartphone. Krzanich showed off a prototype of the un-named smartphone prototype, which is running the company's Atom processor and comes with a 6-inch display. RealSense 3D enables more computing possibilities on a smartphone. For one, users can begin making 3D scans and models in real-time. At the technology showcase at IDF, the prototype that I played with came pre-loaded with a few apps and games that benefit from the "world-oriented," otherwise known as rear-mounted," dual-camera setup. Beyond just simple scans, you can map the world around you with RealSense 3D. By using the camera, users can begin modeling their living room or garden, and then they can build off of that map by placing furniture, flowers or plants into the space. This would be a good app for a landscape or interior designer. Architects can also create immersive building experiences. They can create a home, for example, and then with the camera, they can walk through and traverse the different rooms in the home on a 3D augmented reality tour with their smartphone display. In the example shown at the technology showcase, Intel staff members at the Project Tango booth built a brick home, and you can virtually "crawl" through the brick rooms. Rather than strapping a phone to your head a la augmented reality and virtual reality glasses, you can attach a RealSense-enabled phone onto toys and peripherals to enhance the experience. In another demonstration, Intel attached the phone to a Nerf-like gun. Rather than shooting real Nerf ammunition, you get an augmented reality experience. This could very well be the perfect toy for parents as kids won't be able to do any "real" damage with their virtual bullets. Intel said that the Project Tango phone shown at IDF 2015 is only a prototype and it's up to OEMs to bring RealSense to market. Intel isn't disclosing component costs, saying it varies by volume. The company would not disclose what type of premium a phone with RealSense will have when questioned.